Everyone knows that breakfast is the most important meal of the day (you do know that, right? ), and, despite being in an indeterminate place and time, life on LOST Island is no different—breakfast is important. 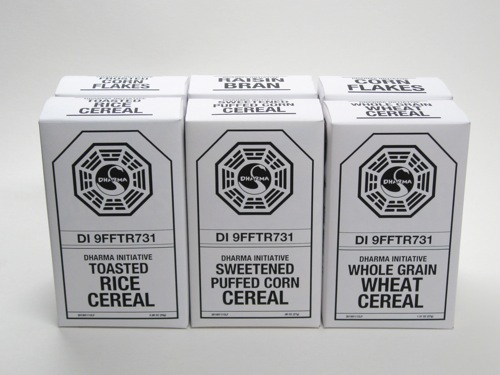 So, when wild chicken eggs, boar bacon, and taro-flour bread are in short supply, make sure you at least have a bowl of DHARMA Initiative Cereal. There’s a wide variety available—from Sweetened Puffed Corn Cereal to Sweetened Multi-grain Cereal—and they’re great with milk or dry. This entry was posted on Tuesday, January 26th, 2010 at 9:28 am	and is filed under Film/Video, Food, Graphic Design. You can follow any responses to this entry through the RSS 2.0 feed. Responses are currently closed, but you can trackback from your own site.